Feel free to take a look around. Get to know my Standard Poodle family and learn more about the Poodle lifestyle. 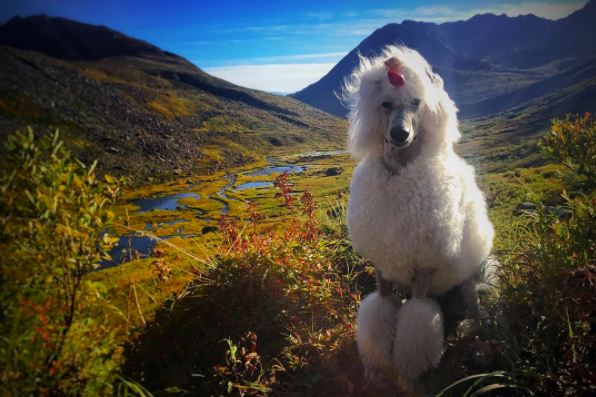 Today you can find me in the mountains of Alaska, always with at least one Poodle by my side. 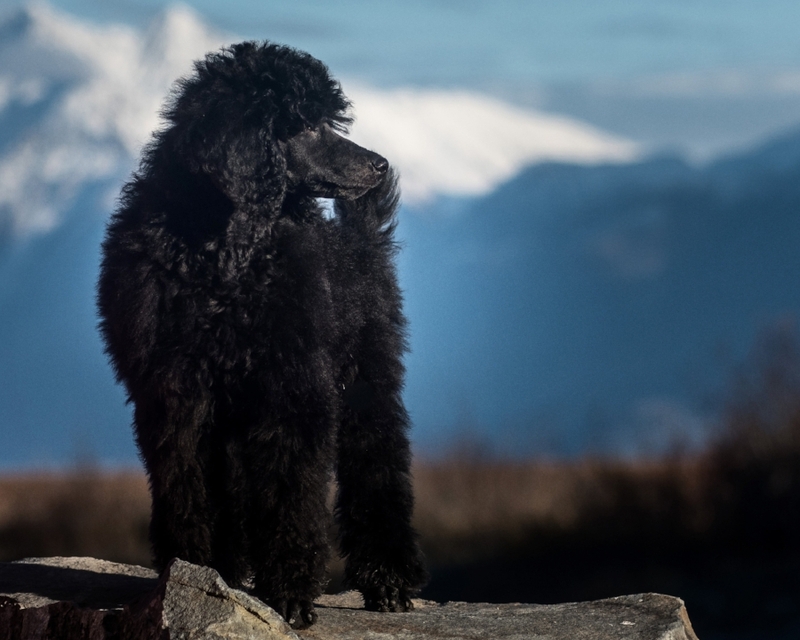 Often you'll see me out climbing, hiking and camping with my Poodles in full show coat! Because... yes! I do show my poodles in American Kennel Club and Canadian Kennel Club conformation shows, as well as performance sports such as Obedience Rally and Agility. I encourage you to take a look through this Galavanting Poodles site. Get to know my Standard Poodle family. Share in the pictures I take of my Poodles, almost daily. And learn more about the Poodle lifestyle, both in and out of the show ring and performance trials, through my blog. Wallace, Wally, Walls, Coolest Dog on the Planet... this black Standard Poodle boy goes by a lot of names. One thing is absolutely certain, though, Wallace is a force of greatness. Wally is my first Standard Poodle. He is from a lovely kennel located in Soldtona, Alaska called Whisper Ridge. Wallace has set the bar very high when it comes to what I expect in Poodle temperament, athleticism, and intelligence. This boy is my rock. My leader, and has the most "showy" personality most folks have witnessed. Wallace has received a Best in Show in Canada and he has his AKC Championship. He has also sailed through his Canine Good Citizen title, his Rally Novice title, and the first two legs of his Rally Advance title. Currently, Wally is working on his agility debut. Wallace is always by my side when I hike. He has been with me through bear sightings, moose sightings, and even porcupine sightings. Always steady and even tempered, Wallace obeys commands and does his job when faced with the challenges of back country adventures. 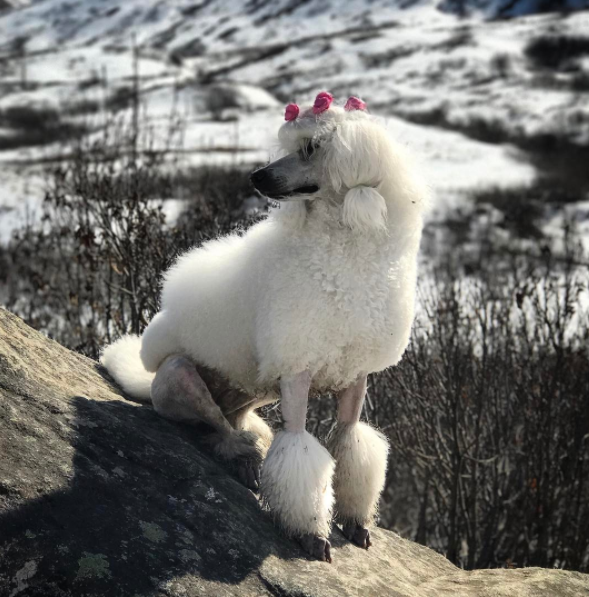 Wallace is an Alaska Poodle through and through. My sweet Pali. So much to say about this precious girl! For starters, she has the most delicate personality. She has a lovely expression that makes you fall in love the instant you see her. Pali earned her AKC Championship title with 4 majors. She also took Best of Opposite and Best of Breed over Specials, from the classes. Watch for this girl, she's something special! Pali is out of CH Lakeridge Calendar Girl and CH Randenn Snapshot. Pali is learning how to hike and adventure in the back country. She is not a very big fan of playing in the lakes, but she LOVES stomping through the shallow mountain streams. Pali's favorite places to adventure are through the moss covered summits in the alpine tundra zone of a mountain top. Bryce came to me by way of Lakeridge Farm's Poodles in Renton, Washington. I had long been an admirer of GCH Brighton Lakeriderigde Encore, Ali. Her presence and movement in the breed ring simply could not be denied. We often describe Bryce as a Poodle who loves love. He LOVES meeting new people. It takes him no time to climb into your lap or snuggle up around your neck. Bryce is equally as goofy as he is a lovebug. He is the court jester in my pack and brings laughter to all who meet him. Bryce is also an outstanding hiking dog. He's still learning the ropes, but he is fearless when we hike. He loves to conquer boulders and will attempt to climb, jump or otherwise ascend any and every giant rock in our path. Bryce's effortless movement helps him to move quickly and gracefully over boulder fields. The newest member of the Galavanting Poodle family is my feisty girl, little Ms Kluane Rose. Klu is owned by myself and her breeder, Renee Koch of Gardenpath Poodles. I am ecstatic to have Kluane and am so looking forward to her career in the conformation ring of both AKC and CKC. Klu has a head to die for, and a gorgeous neck to carry that headpiece. She is described by all who see her as very typey and quite poodley. All in all, exactly the kind of girl I was looking for when I first spoke to Renee about a puppy. This little sweet pea is destined to turn a lot of heads. Watch for her debut in the rings! Kluane loves being outdoors. If she had her choice, and often, she believes she does!, Klu would be outside 24 hours a day, 7 days a week. Nothing worries her. And the inclement weather of Alaska is just a challenge waiting to be met, as far as Klu is concerned. In short, she's going to make the perfect hiking companion when she's grown! Anything in particular you'd like to have me write about in the Galavanting Poodles blog? Don't hesitate to let me know what's on your mind! *The usual warnings apply: I love to talk about Poodles and usually take a few days to respond to honest inquiries. But I don't respond to spam, negative comments, internet bullying, or anything else that can bring a soul down. Life is too good!